Akebia quinata alba and its white flowers will stand out where the dark purple flowers of the species, Akebia quinata disappear into the background. Like the Dark Chocolate variety, Akebia quinata alba bears no scent of chocolate for me. But the fruity fragrant blossoms are pungent enough to fill a garden just the same. The Chocolate Vine has withstood temperatures into the mid teens and not had any dieback. Maybe best of all the White Chocolate Vine seems to be less prone to leaping out from its appointed area at every opportunity than most vines. 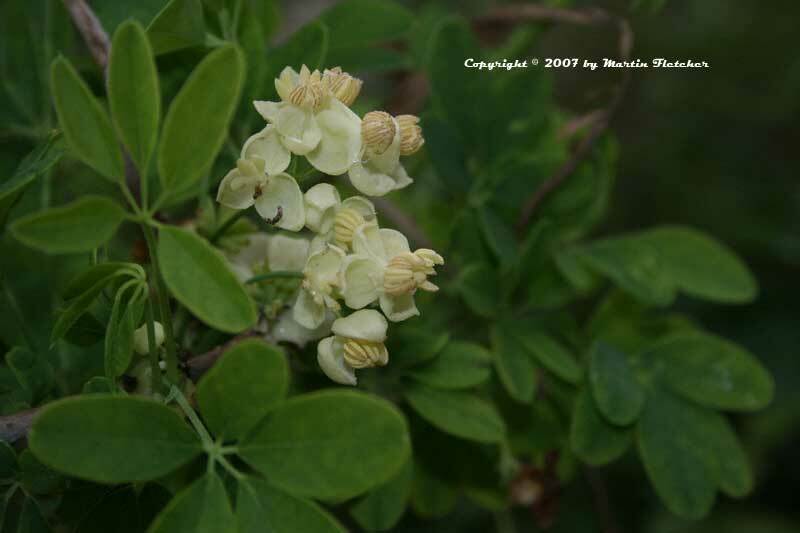 In some areas, particularly in the North East Akebia quinata has become a pest and is on the local noxious weed lists. Akebia quinata alba blooms for about 2 months starting in February. Also look for the Akebia quinata leucantha another white flowered cultivar. Side view Flowers and foliage of Akebia quinata alba the White Chocolate Vine. High resolution photos are part of our garden image collection.